Looking for a versatile and flexible mixing system for live and studio that’s equally at home in houses of worship, broadcast facilities, live venues, touring rigs, and recording studios? Check out the new PreSonus StudioLive Series III S 64- and 32-channel digital mixers with AVB networking and FLEX DSP engine, available in four models with 128-channel (64-x64) USB recording, touch-sensitive motorized faders, built-in multitrack SD recording, 24 DCAs for flexible channel groups, and expandable plug-in processing with vintage-style EQ and compression options available on every input channel and output bus. 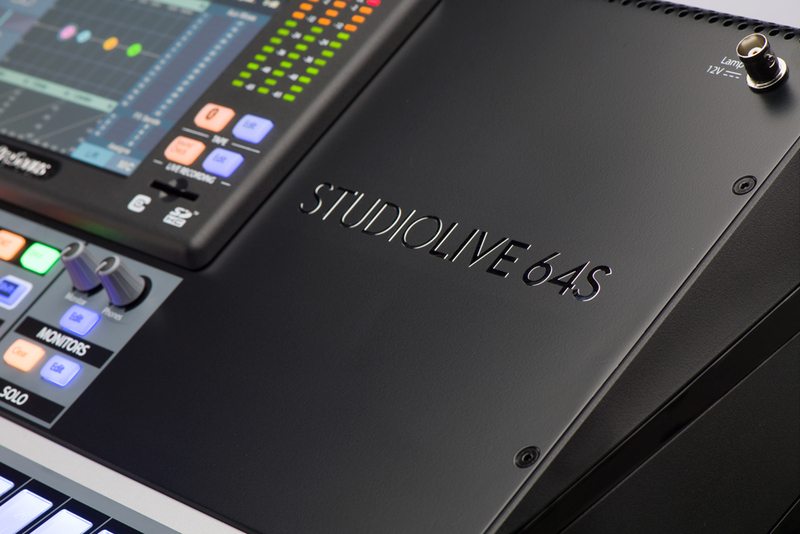 The flagship StudioLive 64S harnesses the power of a large-format console and folds it into a small-format digital mixing platform with 76 mixing channels, 43 buses, 33 faders, and a quad-core FLEX DSP Engine, which offers 526 simultaneous effects. The 64S also features an independent mono/center bus with pre-channel center divergence and level control, 32 FlexMixes for auxiliary, subgroups, and matrix control, as well as eight FX buses and processors. 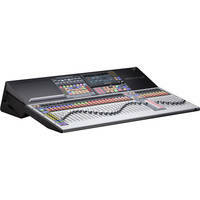 The StudioLive 32S, 32SX, and 32SC each offer 40 mixing channels, 26 buses, a dual-core FLEX DSP Engine to power up to 286 simultaneous processors, and 16 FlexMixes, which can be individually configured to function as aux buses, subgroups, or matrix mixes allowing you to customize your mixer any way you wish. 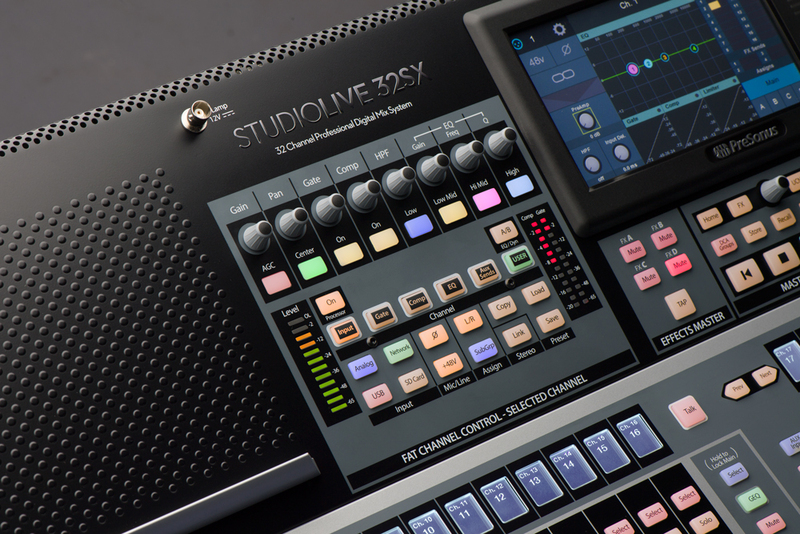 The StudioLive 32S provides 32 local preamps, 33 faders, and a dynamic Fat Channel layout that allows you to access every Fat Channel parameter and aux sends for each channel on the eight Fat Channel encoders with scribble strips. The 32SX delivers the same 32 local preamps but in a 25-fader, low-profile, space-saving frame, while the 32SC squeezes its mixing and processing power into a rack-mountable, road-ready frame with 16 local preamps and 17 faders. The 32SX and 32SC feature a fixed input layer Fat Channel that provides access to eight critical input functions with additional functions available using a combination of the touch screen and focused encoder under the screen. All mixers feature Audio Video Bridging (AVB) networking for compatibility with NSB-Series stage boxes for additional remote analog inputs and outputs, as well as EarMix 16M personal monitor mixers, which offer musicians their own customizable 16-channel monitor mix. 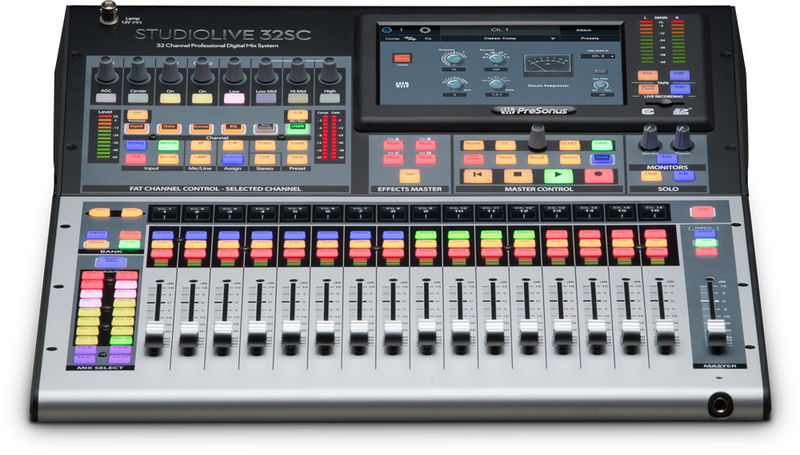 Additionally, multiple StudioLive Series III S mixers can be networked, allowing you to route audio to and from any device network via the internal digital patching available within the mixer. 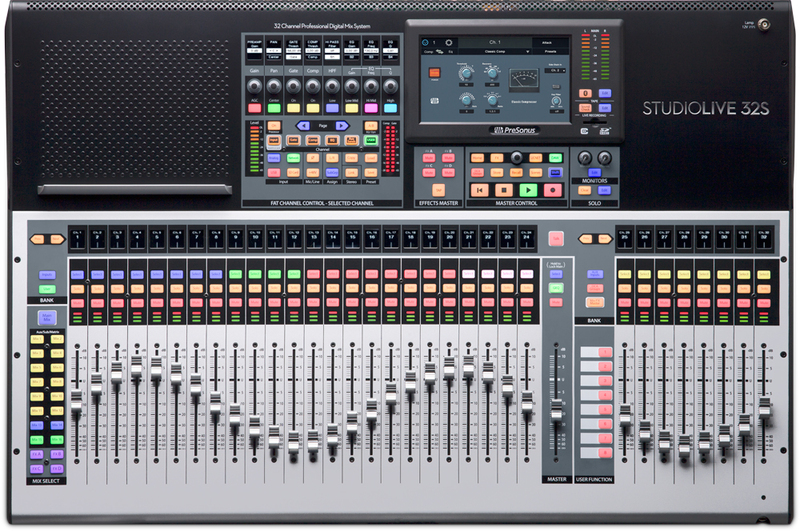 All PreSonus StudioLive Series III S digital mixers are tightly integrated with a suite of state-of-the-art software. In addition to recording with Capture and Studio One Artist, you can mix wirelessly using UC Surface touch-control software for Mac, Windows, iPad, and Android. Control your monitor mixes with QMix-UC for iPhone, iPod touch, and Android devices. Whether you need a mixer for live sound reinforcement, a control surface for the studio, or an all-in-one solution for any venue, consider choosing the PreSonus StudioLive Series III S mixers. Talk with a specialist at the B&H SuperStore or check out our website to learn more!